Olive Oil or Butter, which is the Better? I have been enjoying Paul Bertolli's book 'Cooking by Hand'. From my point of view it is something of a book for reading, but it does contain recipes too. One of the first to catch my eye was a simple and pure recipe for cauliflower soup containing only olive oil, onion, water and salt. "Add cream or seasonings such as curry (a common cure) to cauliflower, or add solid garnishes, and you steal from it", says Bertolli. And so I chose to believe him. And my faith led me to the verge of preaching his gospel. I presented my dedication at the altar. I was about to lead others to worship his vision as disciples had done before me. Then I went to Bar Jules for lunch where cauliflower soup was on the menu. My friend, Penny and I split a bowl between us. Bar Jules are wonderful when you ask of them this favour, they plate the two halves separately and I always appreciate them for their kindly attention to this request. The cauliflower soup looked nothing special. It was white and thick and lumpy. To be honest it would have been difficult to pick it out from a line-up of wallpaper pastes. But once the first scoop of porridgy gloop that was spooned through my lips had glided across my tastebuds, I found myself slouched in curious contemplation. I was certain it tasted even better than Bertolli's. If his was the Jesus of soup, then this was certainly the God. What had Bar Jule's done differently to make it so heavenly? Butter they said. We use butter not oil. Ahhhhhh. 3 - Add Cauliflower, salt and 1/2 cup of water. 7 - Return to the pan to heat before serving, thinning with a little more water if the soup is too thick for your taste. BUTTER: smells cheesey, sour and soft, vegetal. My favourite by far. The milky creamy accent leaves behind a (literally) mouth-watering after taste. It has more cauliflower flavour. If you add black pepper it compliments and draws out the flavours of both the spice and the vegetable. OLIVE OIL: smells peppery, spicy and is heavier. The soup is saltier and dryer on the tongue. Less of the vegetable shines through. Adding oil brings more personality to the soup, but the resulting flavour is then more bitter and olive-like than it is cauliflower. To taste-test both my vegan & non-vegan cauliflower soup recipes, to determine which tasted better, was one of the items I crossed off my August/September to-do list. ?Which do you think would win your own taste test, the olive oil or the butter? For a long time, I would have said olive oil, but because butter fit into my $21 food budget this week and olive oil didn't, I'm reacquainting myself with using butter for cooking. I've got to say...it's quite delicious. A total treat. I've only used olive oil for cauliflower soup. But your description of the butter version as "cheesy" put me over the top. Must try this with butter soon. Actually, Sam, you've inspired me to try simplifying my soup, because I'm always trying to complicate it with things like bacon and cheese to convince my dear picky husband that it's good. Butter for me every time, though, I'm afraid! definitely butter - and that sounds very good - will have to try it when I get my hands on some cauliflower! Very interesting comparison. I'm always trying to substitute olive oil for butter to reduce cholesterol, but I'm not surprised the butter version is better. Nothing tastes much better than butter, does it? I guess I'll just have to eat lots of both and decide. damn. I love dairy. I am beholden to butter. But I've always made cauliflower soup with olive oil. they both serve very different purposes and i love them both. I used to add milk to this, and curry powder, but you made me curious. So I cooked it according to your recipe (with butter) ... and I gotta tell you, your recipe is better. It was a delicious cauliflower soup and just perfect with cracked black pepper on top. Definitely butter. I have a bunch of cauliflower from this week's CSA delivery, so I will give it a try. Sounds wonderful (and easy). Thanks for the inspiration — and the recipe. What's a soup without a knob of butter? I love this simple soup recipe. On my October to do list now! For this dish my money is on the butter. What do I win? BUTTER...I think it will give it a better mouth feel and complement the creaminess of the cauliflower. I will say a drizzle of some infused oil could be nice on top. Best of both worlds. I mean common, fats and oils are just delicious. What, you use water rather than homemade vegetable/chicken stock? I am deeply shocked. 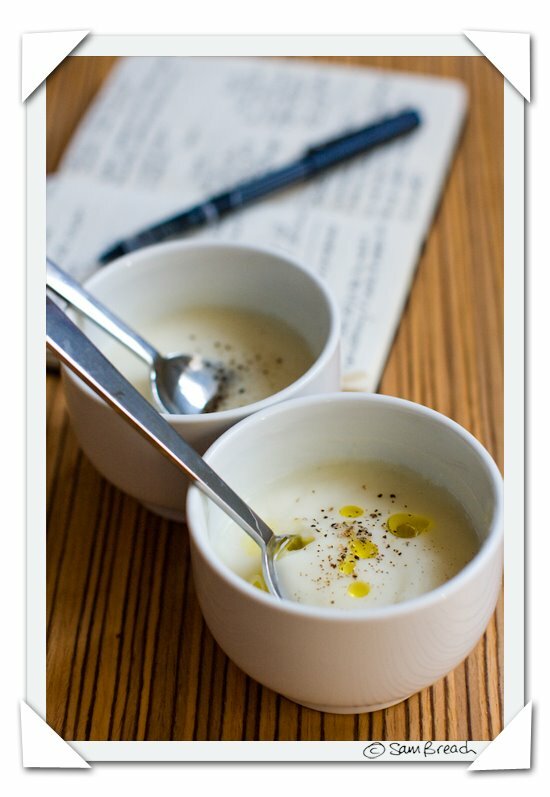 Thanks for commenting on my blog about the soup. I think I will stick with the butter. Sent a batch over to my parents house, my mom said she would have rather I left more lumps. Can't please everyone! I loved Paul's version. But I love butter! I'll have to try the butter version. I usually put a little butter in soup for the initial cooking of the tougher items. Even a small amount seems to make a huge difference and it smells better when cooking. I know I would like both because I like to use sometimes butter, sometimes olive oil. Different tastes for different results, eh? There's a fun trick you can use to compensate for the lack of butter when you make a puree soup using olive oil. I came up with it while I was on a diet for high cholesterol. What gives butter a good amount of its umami are the milk proteins. So, when substituting olive oil for butter in pureed soups, you can add some of those milk proteins in without any fat by using a 1/4 cup or more of dehydrated milk powder, which is almost completely fat and cholesterol free. It's not a complete replacement for butter, but it helps bridge the gap. Olive oil to cook and butter with Baguette for breakfast (always salted butter)! Half butter, half olive oil is the way i will be going with this tasty sounding soup. Butter, butter, butter. There is absolutely no comparison. Unsalted is a must (easier to control the saltiness by adding sea salt after the fact), and preferably artisan-made butter. thank you for the in depth comparison! 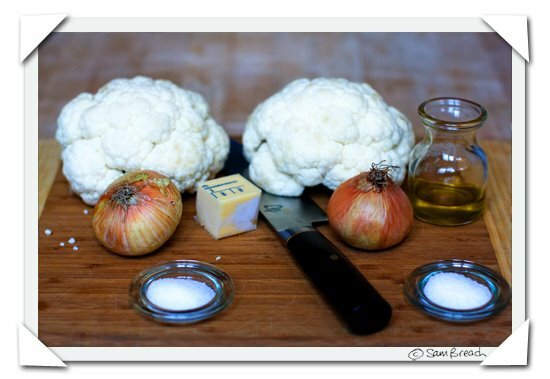 I love cauliflower roasted tossed with olive oil but I think I would better love the soup with butter too! And it looks like you don't need very much to make it sound completely delicious. Why not use both butter and olive oil? Butter browns things so nicely, but nothing beats onions and garlic sautéed in olive oil. A nice alternative is to do half butter and half olive oil. I just made this recipe and will definitely repeat it. Two teaspons of salt was excessive, though. The salt overwhelmed the cauliflower taste. Next time I'll try only 1 tsp. nothing else anyone can say about it! I've made cauliflower soup a lot and it was always just okay. Then I made it with your recipe (with butter), and it was sublime. Thank you for pointing out the error of my ways. Never again with olive oil. If it is for soups I would go for butter. However, olive oil is also a great alternative. Those who love the peepery smell of olive oil can also use olive oil in soups.